The head of the Papua New Guinea’s Bougainville separatist group, the Me’ekamui, says he is against a resumption of mining before a vote on independence. The leadership in the autonomous PNG province has been promoting a return to mining as the filip its economy needs. Do you remember President John Momis, that fearless patriot defending Bougainville from exploitation by foreign predators? No. We don’t either. But overnight, the President has had a conversion and obviously fallen out with one of his rich Australian mates! In an interview with ABC, President Momis has joined with the bloggers and his critics on Bougainville (there is a first for everything) to condemn Bougainville Islands Group’s Executive Chairman, Godfrey Mantle (a property developer from QLD), who has bought up 12,500 hectares of land on Bougainville. The President of Bougainville claims that while perhaps legal, this large scale land-grabbing is unethical. Why after a long and bloody war over sovereignty, Momis argues, should a foreign capitalist be allowed to come in and scoop up Bougainville’s wealth. Are you rubbing your eyes? Is this for real you ask? Yes it is, the interview is below. 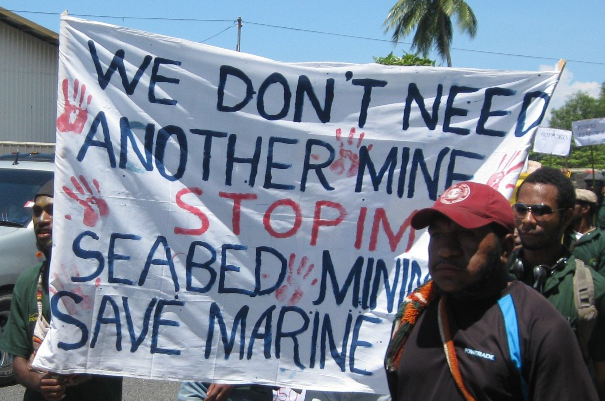 We await eagerly for Momis’ to condemn as unethical BCL/Rio-Tinto’s proposed return. 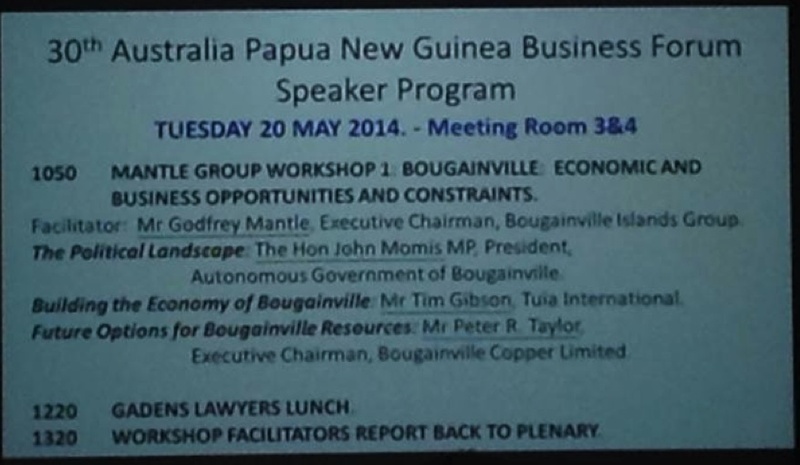 Yet what the President failed to explain to the ABC is why just over a week ago he would honour this unethical land-grabber, Godfrey Mantle, by speaking at a seminar Chaired by Mantle, and sponsored by the Bougainville Islands Group (see photo below). Bougainville’s president John Momis says a major Australian cocoa project may not be ‘ethically right’. The President of Bougainville has cast doubt on the future of a major cocoa project being developed by an Australian-based company. Bougainville Island’s Group, owned by Australian businessman Godfrey Mantle, has acquired 99-year-long leases to 15 abandoned cocoa plantations, totalling 12,500 hectares. Mr Mantle said the traditional landowners will receive a 30 per cent stake in the company and up to 4,000 locals will get jobs. “We just don’t want their ownership we want their involvement, we want to show how a business should be run in best practice but with transparency and a high level of integrity,” he told Radio Australia’s Pacific Beat. However, Bougainville’s president John Momis said while the land leases may be legal, they are not ethical. “We have just had a war over land,” Mr Morris said. But Mr Mantle said he has addressed all of the President’s concerns. He said his company will bring a skilled marketing, distribution and scientific team that will benefit all the island’s cocoa growers. “You need scientists. And the people who benefit from that are not just your plantations,” he said. An inquiry into the project is due to report on its findings next month, but president Momis said it will still take a lot of convincing. “In the final analysis, the people will respect the government,” he said. “We are spending a lot of time with them … telling them that international best practices must be adhered to. He said the Bougainville government would like to encourage joint venture deals between foreign and local companies, rather than stand-alone foreign businesses. “The reason for that is to make the people feel they have a sense of ownership and therefore they will take responsibility to protect the properties and operations of the companies,” Mr Momis said. Cocoa production is booming on the autonomous island. It is putting 200 million kina ($A74 million) a year directly into the hands of small holders. President John Momis said it will delivering more in the near future. “There [are] a lot of new cocoa plantings and we are told by experts that by 2017, cocoa price will triple,” he said. 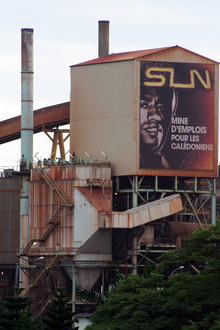 The damage caused by vandalism at the Vale nickel plant in New Caledonia is now estimated to be more than 34 million US dollars. The violence, which began at the weekend, has seen days of confrontations at St Louis near Noumea where about 150 riot police have been battling young Kanaks using firearms. Three security personnel have been shot and injured. The unrest has led to repeated road closures and angered residents unable to travel between Noumea and Mont Dore. Dozens of people have expressed their frustration outside the French High Commission while hundreds blocked the access to the SLN plant in Noumea in protest at some workers risking losing their pay because they cannot get to work. The protest by the young Kanaks was accompanied by calls for the Vale plant to be closed for good after another acid spill three weeks ago led to operations being suspended. Progressive discussions towards agreeing on a Memorandum of Agreement (MoA) for the Woodlark Advance Exploration Project in Milne Bay have so far been satisfactory. Stakeholders in the project expressed their views during a meeting this week in Alotau saying they were happy with the outcomes of the discussions. The stakeholders are the State, DAL Wanuwan landowners Association, the MilneBay provincial government and the developer Kula Gold. State team leader and the Mineral Resources Authority’s (MRA) exploration coordinator for Woodlark Project Moses Mambu said he was expected to conduct two more meetings during which everything should be finalised in preparation for the MoA signing sometime towards the end of the year. Chief executive officer of Kula Gold Ltd Stuart Pether said the level of input by all stakeholders in the meetings was encouraging and indicated a good progress so far. Landowners’ association chairman David Asi said discussions have progressed smoothly since the development forum last December and that he was certain that with the cooperation and understanding from all stakeholders, the parties could agree on an MoA at the end of the year. These preliminary discussions relating to an MoA was conducted in light of the application for a Mining License (ML) for which Kula Gold Ltd has applied for. It was expected that the ML wouldbe granted to the company soon by the Mining Minister Hon Byron Chan. The Woodlark project boasts two million ounces of gold reserves and a life span of 10 years. Depending on further exploration and positive results, the life span of the mine could be extended. Employees of Soil Machine Dynamics (SMD) work on a subsea mining machine being built for Nautilus Minerals at Wallsend, northern England April 14, 2014. 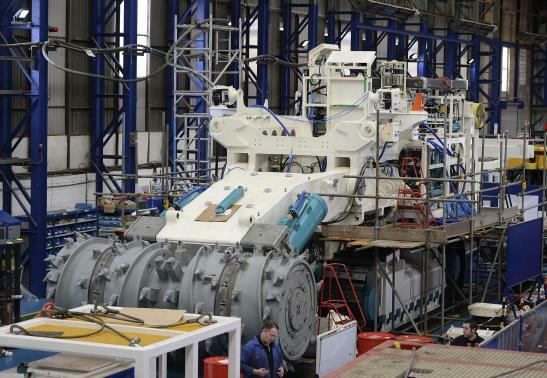 Prospective Canadian deep-sea miner Nautilus Minerals on Wednesday announced that it had started building its second seafloor production tool (SPT), the collecting machine (CM), at third-party manufacturer Soil Machine Dynamics’ (SMD) facility at Newcastle upon Tyne, in the UK. Nautilus, which plans to mine copper and gold from the Solwara 1 seafloor project, offshore Papua New Guinea (PNG), said that it had split excavation and collecting mineralised material into three individual tasks, which would each be carried out by a different SPT. The Toronto-based company explained that the auxiliary cutter (AC) is designed as the pioneering tool, which prepares the rugged seabed for the more powerful bulk cutter (BC), which the company had already built. While these two tools gather the excavated material, the third – the CM – would collect the cut material by drawing it in as seawater slurry with internal pumps and push it through a flexible pipe to the subsea pump and on to the production support vessel (PSV) through the riser and lifting system (RALS). “Having already announced in April this year, the completion of the assembly of the BC, we are delighted that the assembly of the CM has now started, with the arrival of the chassis at the SMD facility. “This is an exciting time for the company as we continue to build the seafloor production equipment. We look forward to start the assembly of the third and final SPT, the AC, when its chassis is delivered next month,” Nautilus CEO Mike Johnston said. Last month, Nautilus reported that the PNG government has paid $113-million into escrow, representing the balance of the State’s 15% share of capital required to complete the Solwara 1 offshore project up to first production. At the end of last month, Nautilus announced that it had resolved the dispute with the State and signed an agreement with the State’s nominee, Eda Kopa (Solwara) Limited, a subsidiary of Petromin PNG Holdings, enabling the project to move forward toward production. With Eda Kopa having paid its share of the project development capital, Nautilus’ focus now shifts to chartering a production support vessel and securing certain intellectual property rights within six months for Eda Kopa. The funds will be released to Nautilus when both conditions have been met. The company is in discussion with potential vessel partners, while also undertaking a tender process with shipyards experienced in building offshore construction vessels. Nautilus own 70% of the project, with the government of PNG holding a 30% interest. Nautilus’s share price had more than doubled since the start of the year, spiking to its highest level in two years last month, after the company announced it had resolved its dispute with the PNG government. However, in the stock’s recent history, at C$0.53 apiece on Wednesday, the share price was nowhere close to the lofty C$3.48-level seen early in 2011. Dozens of protesters have caused tens of millions of dollars in damage to vehicles, equipment and buildings at a nickel mining site in New Caledonia, as anger boiled over at a chemical spill into a local river. The US$6 billion Vale plant at Goro in southern New Caledonia was closed this month after 100,000 litres of acid-tainted effluent spilled, killing about 1,000 fish and sparking protests at the mine site. The Vale plant had been expected to produce about 40,000 tonnes of nickel this year, out of global supply of around two million tonnes. But it has been beset by problems, including spills and protests. Tensions between the local population and Brazil-based Vale escalated over the weekend, with young protesters frustrated at the latest spill and a lack of response from indigenous Kanak chiefs, according to local media reports. Television footage showed images of burned mining vehicles and equipment. “We had burned vehicles, one administration building was damaged, but no damage to the plant itself,” Vale spokesman Corey McPhee said. 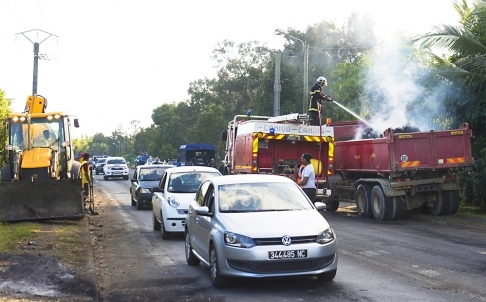 Peter Poppinga, an executive director at Vale, told Les Nouvelles Caledoniennes newspaper that damage to the mining site was estimated at at least US$20 million to US$30 million, including the destruction of perhaps one third of the truck fleet. “If there is no activity for several months, we will shut the plant, but that’s not the case. The closing of the plant is not on the table,” Poppinga was quoted as saying. The French Pacific territory’s southern provincial government ordered an immediate halt to operations and started legal proceedings under its environmental code after the spill. The local government, which had a leadership change last week, has yet to say when Vale can resume production. The New Caledonia police say while clashes near Noumea with young Kanaks opposed to the nearby Vale nickel plant have eased, it is likely more unrest is to come. The youths are calling for the plant, which has been closed for three weeks after an acid spill, to be closed for good. About 150 riot police with armoured vehicles have been trying to permanently re-open a key road south of Noumea, which was first blocked on Saturday when the unrest started. Three police officers have suffered gunshot wounds during the clashes. A police officer says the situation is now stable and the road is open, but he says the Kanak youths involved might try to block the road again during the night. The police officer says they are yet to make any arrests for the shooting and injuring of police officers. In Noumea, hundreds of people blocked access to the SLN nickel plant this morning in protest at some workers risking to lose pay because the road blocks prevented them from going to work. The Pacific Conference of Churches has supported calls from a PNG church for a halt to Deep Sea Mining (DSM). About 1.2 million members of the Evangelical Lutheran Church of Papua New Guinea (ELCPNG) have said no to Experimental Seabed Mining after its synod on Karkar Island, Madang Province. The members have also given their church leaders approval to address the issue with the PNG Government. PCC General Secretary, Reverend Francois Pihaatae, said the initiative was one of self-determination and Pacific people should be encouraged to decide what was best for their future. “Just because Western economic models call for the use of deep sea mineral deposits does not mean we should mine the floor of the ocean with possible disruption of the eco-systems,” Rev Pihaatae said. “Two weeks ago in the Cook Islands the region’s leading authority on seabed mining admitted there is not enough research with which to support the safety of this mining – we must be very careful. This vote against seabed mining is in line with a Pacific Conference of Churches General Assembly resolution in Honiara last year. The church is expected to make a statement shortly, challenging the PNG government’s move to allow international and local corporations to take part in mining the seabed. The church will also challenge Prime Minister Peter O’Neil as a member of the Lutheran church to act on this call from his people. Lutherans make up 20 per cent of PNG’s population.